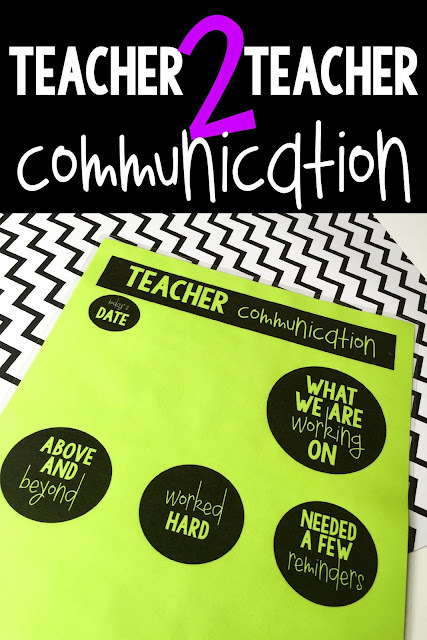 One post just wasn't enough about Teacher to Teacher communication. I have a handful of students that work with a resource teacher at our school (she's my teaching best friend and I couldn't make it through a school year with out her). She is AMAZING and goes to such lengths for the kids and to communicate with teachers. One rambunctious favorite student of mine loved going to her class and needed lots of reminders to on how to behave and to work really hard :/ :/ :/! It was such a problem because there was wasted time...and as a teacher you know how important time is!!! We started using this sheet and It made world of difference in how we were able to work together. I think sometimes as teachers with think that we do our thing and resource teachers do their thing. BUT we always forget that #togetherwearebetter! It was such a positive tool! At the beginning of the year I fill out the date and what we were working on...as the year goes on my students take over and I simply check it before they head to resource. The resource teacher fills out who went above and beyond, who worked really hard, and who (if anyone ;) needed a few reminders. It keeps kids working hard AND accountable. Also, I like to know what celebrations my kids have with other teachers!!! I want to celebrate with them and carry it over to our classroom. I laminate my sheet and just write using an expo or visa-vis usually. If there is a day where there are celebrations or reminders I take a picture of it on my phone to discuss at parent-teacher conferences. We began sharing resources and I had sets of my materials made for students to take back and forth and things for her to hold onto. It worked so well and the expectations were the same. 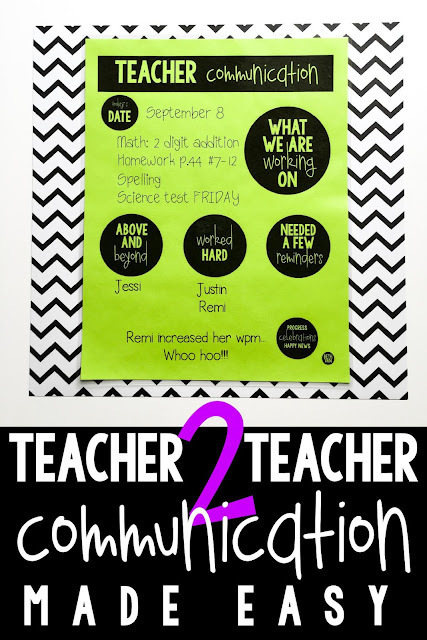 When kids know that teachers are on the same page, they know the expectations are the same, and they exceed them! I had a box for me to write what we learned, my students wrote their homework assignment, and she jotted a note as to what they accomplished! ALSO, behavior...my students know not to mess around...they are there to work and learn and improve. It helps them meet so many learning goals. Here's this! It's for you! Do you send groups of your students to see speech teachers? I love to know what they are working on...it's just for me to see but I love asking my speechers (my nickname for them) what they are up to! Teacher to Teacher communication is the best!